The Anonymous assault against China’s regime continues to see Chinese government websites being hacked as part of an action called ‘Operation Tibet’. 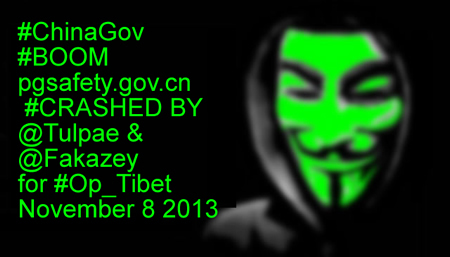 Yesterday, following news that 17 Tibetans had been arrested by Chinese paramilitary forces in Nagchu, Eastern Tibet, hack-tivists responded by crashing the site http://www.naqu.gov.cn for that region. Today another Chinese government site has been hacked, http://www.pgsafety.gov.cn/ thanks to our friends over on Twitter for the heads-up on this latest action. Doesn’t China have enough to do?